However, as she gets to know her new master, she realizes there is more to him than meets the eye. Over time, she is able to penetrate his tough exterior and begins to understand the struggle of a man who believes love is a weakness, but whose heart is now yearning for something unknown. Inkitt has been good to me over the last few months. I have reviewed many good books for them. Books that I enjoyed reading. 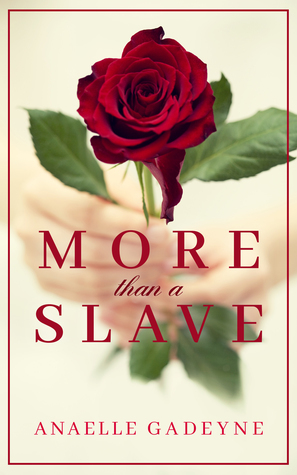 So when I was asked to review More Than A Slave, I didn’t hesitate because of my history of getting good books from them. I was actually excited to read it. So, needless to say, I went into this book with high expectations and oh boy, did they get smashed. This book takes place in America (around Marietta, Georgia if I am not mistaken)….pre-Civil War. Aria’s parents sold her into slavery because they all were starving and they needed the money. They sold her to a family friend with the stipulation that she would be treated well and off they went with their lives. 8 months later, Aria is being brought to auction to be sold because she was very disrespectful to her master. Aria is dragging into town on a rope by her master and she catches the eye of Lord Alexander Anderson. Alexander is from England and has settled in Georgia with his sister and brothers to make a new life for himself. He quickly built a reputation for being a cruel slave owner. The slaves that go work at his manor are never released and never seen alive again. He is so casual about talking about killing slaves with his brother Oliver, it made me sick. Aria is bought by Lord Alexander and brought to his manor along with another slave called Harriet. She keeps running into Alexander and he keeps treating her like she isn’t a slave. Except when he wants to make a point and then he gets mad and treats her like a slave if that makes sense. But he always feels bad and apologizes to her. Their relationship quickly escalates to her sharing his bed (not sleeping with him) and her getting very upset whenever he kills someone or threatens to kill someone. At one point in the book, she makes him promise not to kill someone when he gets mad. The book is put down but this time I went “Great, he’s a psychopath (because he enjoys killing)”. He actually kills one slave after she got into a fight with Aria. That scene was gruesome and so unnecessary. He goes on to imprison her father (in his defense, he didn’t know it was her father at the time) and then tells him to never talk to Aria again, takes part in this hunt called “Little Red Riding Hood” (slave girls were put into red capes and set loose in woods for the lords to hunt down and kill), torture Harriet (Aria’s archnemesis) and Aria’s old master. Plus, when he gets mad, he beats on one of his siblings. But it’s ok that he does it because deep down he’s a good guy, he just had a hard life. Excuse me while I go puke. It sounds like every excuse that people make for an abuser. The end of the book was a surprise too because of the turn around Aria does on certain subjects. To be honest, I was proud of myself for finishing this book without having a meltdown or DNF’ing. Why: Awful storyline. Awful characters. I couldn’t wrap my head around the use of slavery during Colonial America as even being OK to use as a romantic plot line.